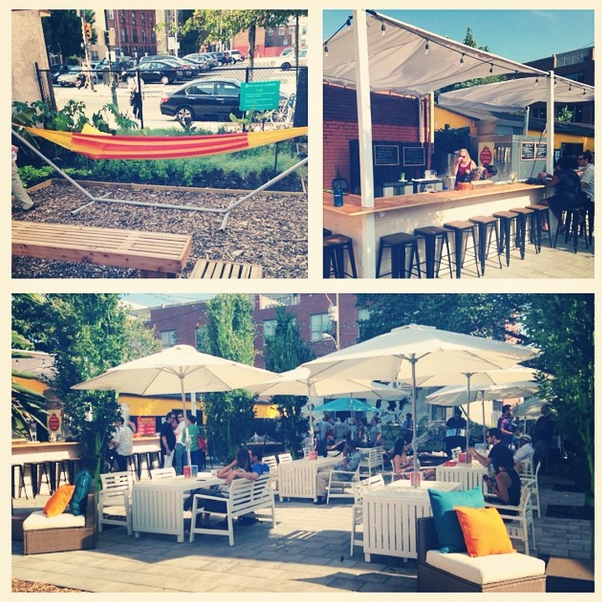 Which Philly Beer Garden Should You Visit? 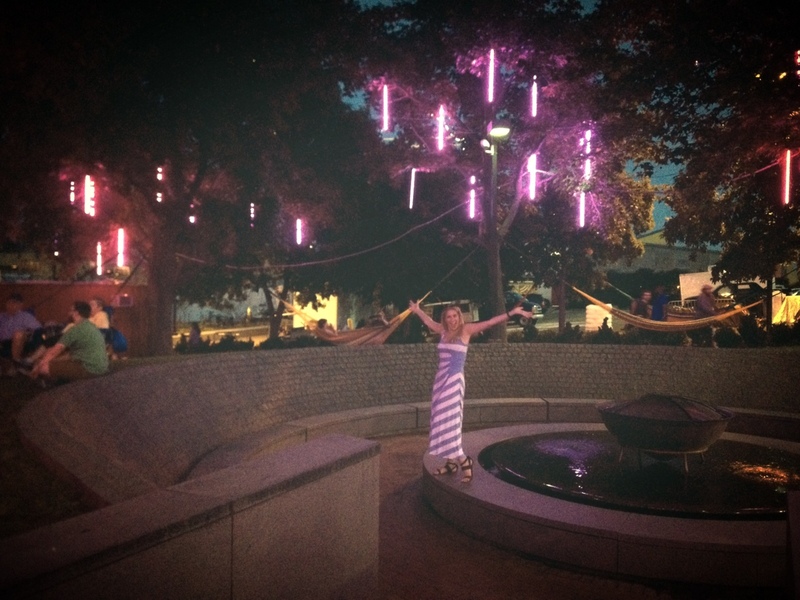 I don’t know if you’re aware of this but, when it comes to Philadelphia Beer Gardens… I’m kind of a local celebrity. 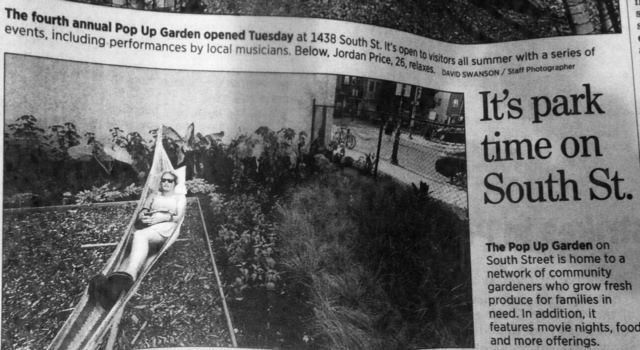 No big, that’s just me, Jordan Price, 26, relaxing in the PHS Pop-Up Beer Garden…. featured in the Philadelphia Inquirer. Apparently, I lounge so well that photographers just wanna snap shots. I get it. If you’ve spent any time with me this summer, you’ll know that I suggest a beer garden pretty much every single night. Because when the sun (or moon) is shining, the temperatures are as comfortable as they’ve been, and Philly’s BGA (Beer Garden Abundance) Scale is off the charts, why WOULDN’T you want to bring a bunch of friends and nosh/sip in the great outdoors? But you might be wondering: Which of the new Philly beer gardens is the right fit for me? Used to accept credit cards… now I think cash only! Last year’s PHS Pop-Up Garden gave off this very rustic, autumnal vibe. You wanted to spend an entire Indian Summer there. This year, the vibe is much more Ikea wishes you a “Bienvenido a Miami” (Smith, 1997). Located between Broad and 15th on South Street, I’ve visited this spot a handful of times and each experience has been… mostly pleasant. They bring in tasty food trucks and are right next to the jerk chicken hut if you’re feeling peckish. My only complaint would be the size, which lends itself to a major issue: the dreaded PPP (porta-potty-proximity). When the wind shifts, and it’s a little later in the evening, the area closest to the porta potties begins to smell more than a little ripe. -YOU! Especially if you’ve always been known by your friends as “that guy” or “that girl”. The one rocking the fedora year-round, who yearns to take their talents to South Beach. And if you dig something other than beer, while you can’t swim up to this bar, you can definitely nab a refreshing dark n’ stormy or vodka basil lemonade (which is…. so good) to beat the heat. Food: IT’S AMAZING! Every bite I’ve had has been great, and features everything from cheese curds, wings, and fries (FRIED EVERYTHING!) to salads, steak frites, and DIY S’mores. So the Independence Beer Garden (or “IBG” as it’s affectionately known) is not (I repeat NOT) a pop-up. They REALLY want you to know this, and will immediately respond to any tweets with silly hashtags like #WeAreNotAPopUp, #WeAreSimplySeasonal, and #FullLiquorLicense. (If you’re unsure of why they’re so serious about this designation, check out the article on the Liquor Control Loophole that pop-ups utilize, and some of the comments/responses). That said, though, it’s true. On first glance, this may seem like a pop-up. Then you realize: they have a full wait-staff. Two bars running draft lines, making cocktails on the fly, and whipping out wine when requested. Also, their kitchen is pumping out some of Philly’s finest al fresco foods you can find. We get it, @PHLBeerGarden. You’re not a pop-up. You’re so much more. They’ve got ping pong, bocce courts, giant jenga, and tons of seating. The bathrooms are basic, but definitely not porta potties, and the space is kept immaculately clean. Needless to say, I love that this spot isn’t a pop-up because there’s the potential for continued presence. Time will tell…. -The beer lover! With ten draft lines and the option of getting beer by the pitcher, gone are the days of waiting in line every time you want a single beer. Just stock up on a pitcher and park it by the ping pong table. -Large groups. Enormous picnic tables that can house 10-14 people (we get pretty cozy, my friends and I), a relatively open bar area, and a very communal vibe, swing by IBG when you’re rolling deep. -Gamers. But maybe not like WoW/Halo… I’m talking people who wanna get competitive, throwing bocce balls and pinging some pong. Food: The Blue Anchor AND assorted “carnival” goodies like cotton candy and funnel cake. I’ve only tried the shoestring fries. And had to stop because they’re wonderful and my blood pressure asked me to. It’s puppy and child friendly, so I get to watch joyful small creatures scamper about. It’s on the water, and occasionally hosts events like SUP Yoga and little duck paddle boats, as well as a river breeze that refreshes the soul. Hammocks, far as the eye can see. Like… over 55 hammocks. Oh yes… and at night…. magical fairy twinkle lights. I’m not one to speak in hyperbole [yes, I am] but this place is THE BEST!! Whether going to read a book in the dwindling remnants of sunshine or enjoy a cold brewski on the scenic (kinda) Delaware River…. I am trying to spend all my time here. –Literally any sized group. Singles, families, date night, giant posses. There is a spot for you. -BABIES! More appropriately: The whole family! There are toys, occasionally live music, video game mini-arcades, giant chairs on which to take photos. It’s ideal. -Instagrammers. I can’t tell you how picturesque it is, so just like…. search Instagram. 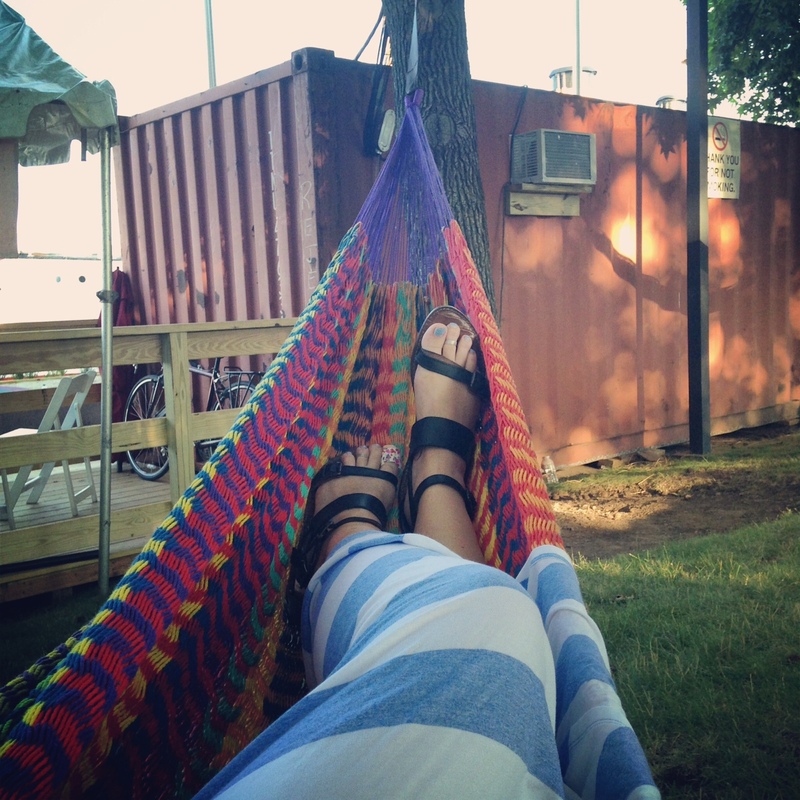 Hammock foot photos (totally guilty), lit-up floating gardens (also guilty), adirondack selfies, that enormous chair I just mentioned, twinkle fairy paradise. -Gamers AGAIN! : Giant Chess! Giant Jenga! I think I saw large Lego blocks. Definitely shuffleboard. And ALSO: those video games that TRUE gamers dig. -Honestly? ANYONE! I can’t imagine the person who wouldn’t like this place. And if you’re that person…. well, I guess I’ll see you in the autumn. Because I’m Harbor Park-ing until the bitter end (August 31st).